Local photographer Amy Joseph was capturing images of the Oceano Dunes on Saturday afternoon when she took a few photos of what she thought was a stray horse. 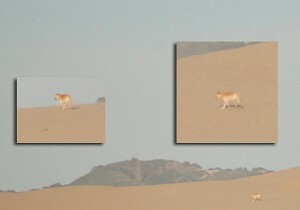 To her surprise, zoom images appear to show a mountain lion running along the dunes. In the past, rangers have noted lion tracks in the sand, primarily in the area between West Grand Avenue and Pier Avenue. The Central Coast is recognized as mountain lion habitat. Mountain lions are quiet, solitary and elusive and typically avoid people. * Do not hike, bike or jog alone. * Avoid hiking or jogging when mountain lions are most active—dawn, dusk and at night. * Keep a close watch on small children. * Do not approach a mountain lion. * If you encounter a mountain lion, do not run; instead, face the animal, make noise and try to look bigger by waving your arms; throw rocks or other objects. Pick up small children. * If attacked, fight back. There is no way that is a mountain lion. The body is too thick, the head is too large, the body and tail are too short. Either Amy spent 12 minutes on Photoshop and is messing with us or someone is missing their lion. Here kitty kitty kitty! For the love of god people! Follow up on this! amy, it’s cool. I wasn’t trying to attack you or the image. It is pretty easy to make a grainy image like this on Photoshop. I doubt this is the case, based on your spirited response. While I may not have researched the source of the image, I did research the physical characteristics of a mountain lion. The creature in your picture does not fit the description. That’s not an attack on anyone, it’s an observation. More than anything, I’m curious if there is a privately (or illegally) owned lion, that someone is scared to report missing. I have no doubt all the animals listed inhabit the dunes ecosystem, personally I’ve seen all but the plover and the re-legged frog. I wonder why the lion was out and about on the dunes? What is out there for them to catch and eat? I thought they preferred wooded or rocky areas where they are less visible? That lion was as big as a horse. It looks more like a lioness than a mountain lion, but what are the chances of that? Obviously, the mountain lion is unaware it is being harmed by the use of OHVs at the Dunes. Someone should let it know, right away! The dust is just killing it….